The menorah (Hebrew: מנורה) is a sacred candelabrum used in Jewish ritual practice, and one of the oldest symbols of the Jewish people. In ancient times, the menorah once played a central role in the ritual activities of the Jewish Tabernacle, and subsequent Temple of Jerusalem, as a golden lamp used to illuminate the Ark of the Covenant. The original seven branched menorah symbolized the burning bush as seen by Moses on Mount Sinai, and thus represented the light of God. 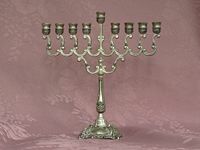 Later, a special type of Menorah, known as a Chanukkiyah or Hanukiah with nine branches, became associated with the Jewish holiday of Hanukkah. 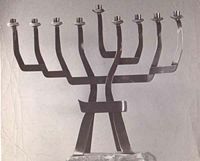 This nine-branched menorah symbolized the miracle of the eight days of light that illuminated the Temple of Jerusalem following the revolt of the Maccabees in 166-65 B.C.E. (The ninth branch was used to light all the other candles). The menorah continues to play an important role in modern Judaism both as a symbol of God's boundless light, and as a prominent feature in the ritual practices of Hanukkah. 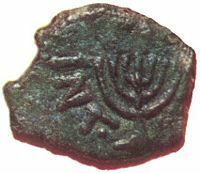 A coin issued by Mattathias Antigonus depicting a Jewish menorah, c. 40 B.C.E. According to the Torah, God revealed the design for the menorah to Moses (Exodus 25: 31-40). The menorah was forged from a single piece of gold with seven branches each having a lamp at the end to be used for burning olive oil. This golden menorah originally illuminated the contents of the Tabernacle (the portable sanctuary made by the Hebrews during their time in the wilderness). Following the construction of the Temple of Jerusalem, the golden seven-branched menorah was placed in the Temple and kept continually lit. However, with the destruction of the Temple by the Romans in 70 C.E., the original menorah no longer had any formal role in Jewish worship. Indeed, due to the sanctity of the Temple and its appointments, some Jewish authorities have since forbidden the manufacture of menorahs resembling the original one used in the Temple. First, it has been suggested that the menorah originated as the tree of life symbolizing the mother goddess Asherah. In the Pentateuch, it has been purged of all polytheistic symbolism. A third theory suggests that the menorah resembles an indigenous plant grown in Israel called the moriah. This plant typically has seven branches, leading to the argument that it provided the inspiration for the design of the original menorah. According to some readings, Maimonides stated that the menorah in the Temple had straight branches, not rounded as is often depicted. However, Jewish depictions of the menorah dating back to Temple times, along with the depiction on the Arch of Titus showing the Romans taking the looted Menorah to Rome after the Temple's destruction, contradict this claim. The nine branched Menorah has become closely associated with the Jewish holiday of Hanukkah. 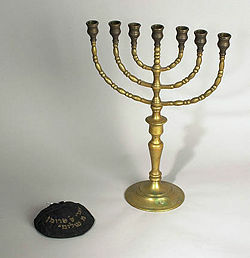 This menorah is called a Chanukkiyah or Hanukiah (חַנֻכִּיָּה). It is lit during the eight-day holiday of Hanukkah and consequently it is also commonly called a "Hanukkah menorah." The name "chanukkiyah" was given only in the end of the nineteenth century in Jerusalem by Eliezer Ben Yehuda's wife, the reviver of the Hebrew language. Hanukkah celebrates the rededication of the Temple after the successful Jewish revolt against the Seleucid monarchy. According to the Talmud, after the desecration of the Jewish Temple of Jerusalem, there was only enough sealed (and therefore not desecrated by idolatry) consecrated olive oil left to fuel the eternal flame in the Temple for one day. Miraculously, the oil burned for eight days, which was enough time to get new oil as well as finish rebuilding the Temple. The Hanukkah Menorah therefore has not seven, but nine candle holders. The four holders on either side are to represent the eight-day celebration of the miracle of oil, while the one in the middle, called the Shamash, is used to light the others. While this type of menorah is technically called a Hanukiah, the "menorah of Hanukkah" is sometimes simply called a menorah. In celebration of this miracle, the chanukkiyah has eight branches for eight candles or oil lamps, none higher than any other, except for one higher branch for the auxiliary candle, or shamash, which guards against secular use of the other lights and is also used to light them. The common reason for the number of the candles is that they symbolize the eight days of the miracle. Each night an additional light is kindled—one on the first night, two on the second night; and so on—until on the eighth night of Hanukkah all eight lights, plus the shamash, are lit. Another possible reason for the eight branches of the Chanukkiyah, as opposed to the seven in the traditional menorah in the temple, may be because according to halakha, it is forbidden to make a menorah similar to the one in the temple because of its sanctity. Another interpretation for the eight-day ceremony is that it commemorates the story of Hannah and her seven sons. The story depicted in the Talmud and in the Book of Maccabees accounts how Hannah's seven sons were tortured and executed according to Antiochus' policy when they refused to bow to a statue and to taste pork. Hannah herself committed suicide after the death of her sons. The fate of the menorah used in the Second Temple is recorded by the Jewish historian Flavius Josephus, who states that it was brought to Rome and carried along during the triumph of Vespasian and Titus. A depiction of this event is preserved on the Arch of Titus that still stands today in Rome. The menorah probably remained in the Temple of Peace in Rome until the city was sacked by the Vandals in 455 C.E., and was brought to their capital, Carthage. But the Byzantine army under General Belisarius took it back in 533 and brought it to Constantinople. According to Procopius, it was carried through the streets of Constantinople during Belisarius' triumphal procession. Procopius adds that the object was later sent back to Jerusalem. This may be a pious legend. Many synagogues display either a menorah or an artistic representation of a menorah. In addition, synagogues feature a continually lit lamp in front of the Ark, where the Torah scroll is kept. Called the ner tamid, this lamp represents the continually lit menorah used in Temple times. A menorah appears in the Coat of arms of the State of Israel. ↑ Asherah, the Tree of Life and the Menorah. Sophia Fellowship Feminist Theology Lecture. The College of St. Mark & St. John, Plymouth, UK. December 4, 1996. Retrieved April 24, 2007. ↑ Mandel, Seth. The shape of the Menorah of the Temple. Avodah Mailing List 12: 65 (Friday, December 26 2003). Retrieved April 24, 2007. This page was last modified on 17 September 2018, at 21:04.